Texans over BUCCANEERS- This game is a case of too much offense (even if Andre Johnson doesn’t play) against too little defense. Houston’s running game has one of the best, if not THE best running back tandem of Arian Foster and Ben Tate, in the league. And the Bucs have allowed runs of 20 yards or more to 11 RBs this year. Josh Freeman will be looking to air it out as the Texans run up the score and the bad news is that he has really no one to throw the ball to. We think if you have Houston as your Defense this week, use them with confidence. Texans win their fourth straight by at least 10-14 points. 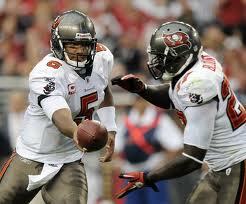 #5 QB Josh Freeman hands off to RB LeGarrette Blount but will need to pass the ball vs Houston this week. Photo: Harry How/Getty Images N.A. PANTHERS over Titans- Only the Eagles, Packers, and the Patriots average more than the 6.4 yards per play of the Cam Newton led Carolina Panthers. RB Jonathan Stewart has been coming on his last two games and is making an offensive impact. TE Greg Olsen should also have a great day as the Titans allow a ton of points to TE’s (5th in the league). Titan’s under achieving RB Chris Johnson, struggling mightily most of the season, showed some life last week and will be the main offensive threat against a Panther team that doesn’t stop the run well. Not sure if that’ll be enough against the explosive Panthers. 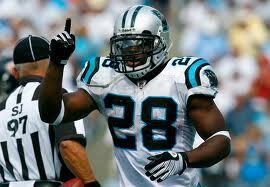 #28 Panther's RB Jonathan Stewart should have a productive day vs the Titans. Here he reacts after scoring his first NFL TD vs the Bears. Photo: Kevin C. Cox/Getty Images N.A. EAGLES over Cardinals- Arizona RB Chris ‘Beanie’ Wells has been dealing with a neck stinger and a sore knee and although listed as probable for tomorrow’s game, won’t be at 100%. With QB Kevin Kolb still out, we just don’t see how backup QB John Skelton (no relation to Red) will fare any better than he did last week. He’s gotten the pigskin to the Cards’ main offensive threat WR Larry Fitzgerald enough, but he’ll need more originality and a different cast of players to be of any real danger to the re-surging so-called ‘Dream Team’; Eagles. QB Michael Vick will have an easy time with all of his weapons dismantling the house of cards and should take this one in a landslide. 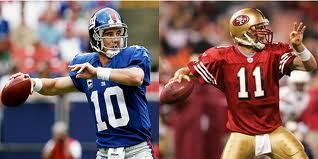 N.Y. Giants over S.F. 49ERS- The 49ers have been doing just enough to win and stay a top the NFC west division most of the year. 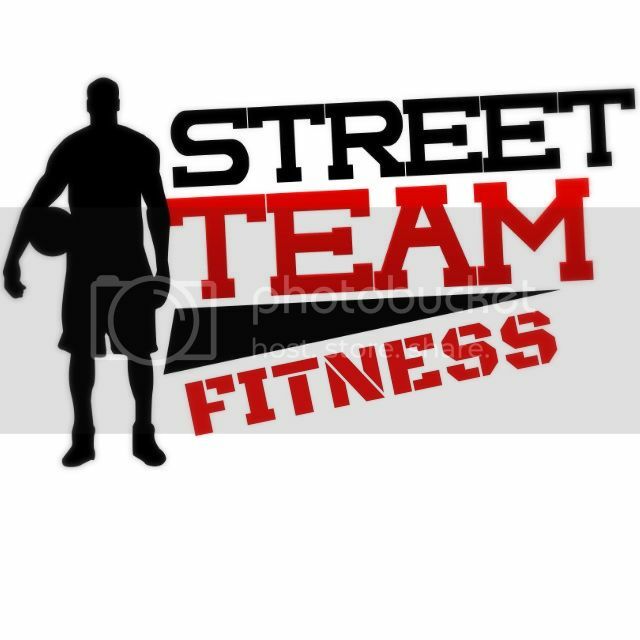 Not with offensive prowess or explosiveness but just by playing great ‘D’ and scoring more points than their opponents. They keep their turnovers low and have a smart QB in Alex Smith. RB Ahmad Bradshaw has been ruled out for the G-Men so Brandon Jacobs gets the start again this week. Frankly, we don’t think that will matter as S.F. has yet to allow a rushing TD to an opponent all year. 49er TE Vernon Davis, usually quite capable, has yet to catch for more than 47 yards in a game, and their only other deep threat, WR Michael Crabtree, will see man & double coverage. Expect Eli to air it out 35-40 times in this one and find WR’s Victor Cruz and Mario Manningham more often than not, with a dash of TE Jake Ballard thrown in for good measure. This could also very well be the stiffest defensive team the 49ers have faced all season and Smith could be seeing a large dose of rushes all afternoon. Giants in a 24-19 kind of finish. N.Y. JETS over N.E. Patriots- Saved the best for last… We picked the JETS last week and they had one of their best games of the year. They will need to repeat that performance again tomorrow night in order to pull off another victory against the arch-rival Patriots who just do not look like the Pats of old anymore. If it wasn’t for the pitiful Colts, the Patriots would be in last place in pass defense. QB Tom Brady has looked and played like a mid tier QB of late and has been hit, sacked and picked on by opposing secondaries. One of the biggest games of the week! The Patriots also have not been able to do much on offense over their last three trips to E. Rutherford, scoring an average of only 14 points a game. As for the Jets, they have been amping it up a notch with RB Shonn Greene coming on of late and birthday boy QB Mark Sanchez improving as well. 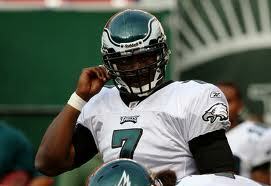 He should have an all-star like game this week against the lackluster defense of the Pats. There is also a huge intangible that will benefit N.Y. this week: it’s called confidence-and that’s what comes with every big win. “We’re ready. We’re playing our best football”, said Jet TE Dustin Keller. “We’re going to win this game”. We agree with Dustin.